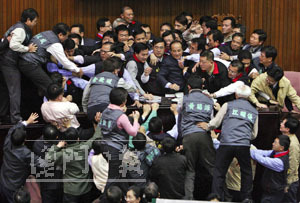 TAIPEI, Taiwan (AP) – A ruling party lawmaker threw a shoe at the speaker of Taiwan’s legislature on Friday and assorted colleagues pushed and shoved each other, throwing the final day of the winter legislative session into chaos. The scenes were reminiscent of past Taiwanese legislative brawls, and represented another low point in the island’s sometimes stormy transition from dictatorship to democracy. Comment: Like the Founding Fathers, I don’t believe in democracy. Like the Founding Fathers, I believe that democracy is the worst political system mankind ever devised. Therefore when I reject democracy in favor of genuine liberty, in favor of Free Market Anarchism, I am being scrupulously consistent. The Taiwan independence movement, on the other hand, insists that it believes in democracy, in universal suffrage, majority rule, and free and fair elections. The Taiwan independence movement, insists that “freedom, democracy, and human rights” are inseparable parts of an all or nothing package deal. Therefore when the Taiwan independence movement rejects democracy, correction, betrays democracy, it is being flagrantly hypocritical. It is demanding credit for defending democracy, even as it is destroying democracy. Strictly speaking, this latest farce is not news. It is merely the most recent example of how the Taiwan independence movement always behaves when playing by democracy’s rules of the game won’t allow it to get what it wants. Associated Press: Friday’s trouble erupted when dozens of lawmakers from the ruling Democratic Progressive Party stormed the speaker’s dais to prevent voting on a proposal to change the composition of the Central Election Commission. Comment: If you’re searching for the passage that identifies the culprits in this farce, this is it. 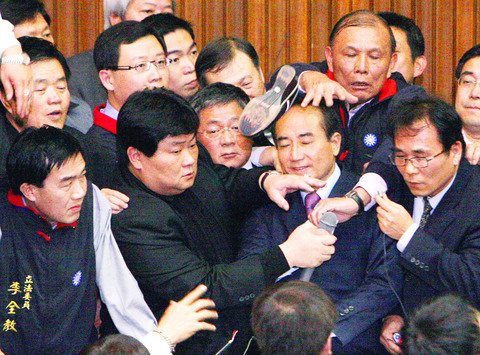 The “Democratic Progressive Party,” knowing it lacked the votes to block an opposition election reform bill, prevented its passage by physically pushing Pan Blue legislators off the podium by force. Strictly speaking, we could conclude our expose of the Taiwan independence movement’s contempt for democracy, the political system the Taiwan independence movement professes to hold sacred, right here. Associated Press: The commission is responsible for administering elections on the island of 23 million people and is generally considered nonpartisan. Comment: Wrong. The Central Election Commission is a tool of the ruling DPP, and widely known to be a tool of the ruling DPP. The Central Election Commission can be counted on to act as the ruling DPP regime’s accomplice whenever the ruling regime feels it can get away with election fraud. Associated Press: Opposition Nationalists responded to the DPP’s move by rushing forward to protect speaker Wang Jin-pyng, one of the Nationalists’ senior members. Comment: Note that the opposition Nationalists “responded … by rushing forward to protect.” Note that the opposition Nationalists were not the aggressors. Note that the opposition Nationalists were merely engaging in self-defense. 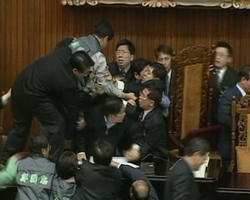 Associated Press: DPP lawmaker Wang Shu-huei flung a shoe at the speaker, but it struck the face of a lawmaker next to him. 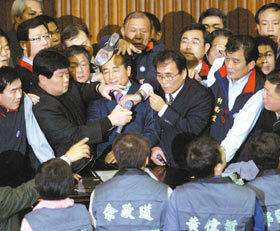 Another legislator threw the shoe back at Wang Shu-huei and ripped up a DPP political placard. 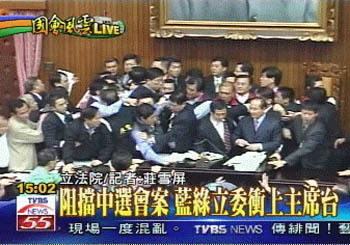 Earlier, a DPP lawmaker grabbed a Nationalist by the jacket collar and tried to push him down against a desk, while dozens of legislators pushed and shoved in the background. Comment: The legislator who threw the shoe back at Wang Shu-hui was Yen Ching-piao, an independent belonging to the Pan Blue alliance. 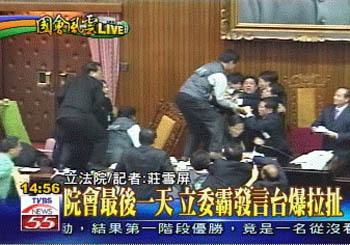 Note that Yen “threw the shoe back,” not “threw the shoe.” DPP legislator Wang Shu-hui was the one who threw the shoe, her own. And not just one. She threw her other shoe a few moments later. I emphasize this because media hacks often engage in a phony brand of “fairness” which is anything but. Instead of frankly identifying victimizers and victims, these media hacks adopt a pusillanimous “Two wrongs don’t make a right” posture that victimizes the victim a second time by making him share the victimizer’s guilt, 50/50. We know perfectly well who the victimizers were. They were caught red-handed, on live television, committing assault and battery. They can hardly deny what they did. They were leaders of the Taiwan independence movement, a political movement that can be counted on to resort to fraud or force whenever they lack a democratic majority. Associated Press: Taiwan’s Legislature has a reputation for violent incidents ever since the dismantling of martial law in 1987. Comment: In other words, ever since the adoption of democracy. Associated Press: Friday’s brawls followed a motion by the opposition – which holds a slim majority at the 219-seat Legislature – asking for the Central Election Commission to be selected according to the parties’ electoral strength. 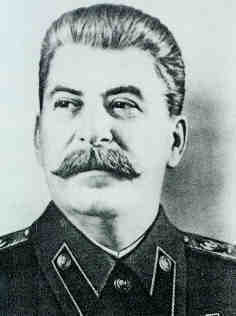 At present, members of the commission are nominated by the government and approved by the president. The opposition called the commission’s impartiality into question amid months of legal wrangling following President Chen Shui-bian’s narrow victory in the 2004 presidential election. Whether Uncle Joe was in fact the originator of this quote doesn’t matter. What matters is that it is true. In 2004, the Central Election Commission enabled Chen Shui-bian to refuse to vacate the Office of the President, despite the fact that he lost to Lien Chan by a six percent, 47 to 53 margin. Is it any wonder that the DPP is determined to pack the Central Election Commission with its own people? Is it any wonder that the DPP is ready, willing, and eager to resort to undisguised physical force in the process?